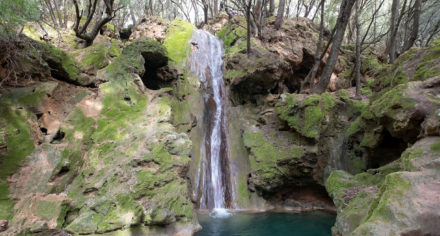 There are different ways leading up to Castell d’Alaró – my favorite starts near Orient. We climb a fence and get into an enchanted grove of age-old olive trees that look like they were frozen right in the middle of a passionate dance. 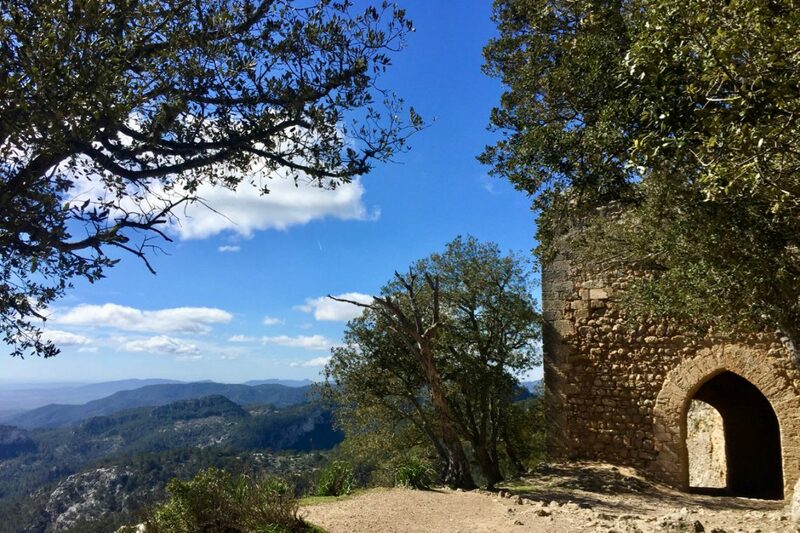 There are countless tales about the Castell to keep your imagination busy: when it was built and by whom, stories of sieges, defeats, and conquests, of kings, armies, and heroes. But the story of the dancing olive-trees is still mine to be told. Some other time. Shortly after the grove, the path starts to steepen, zigzagging through thick evergreen-oak, and I deeply inhale their aromatic scent. 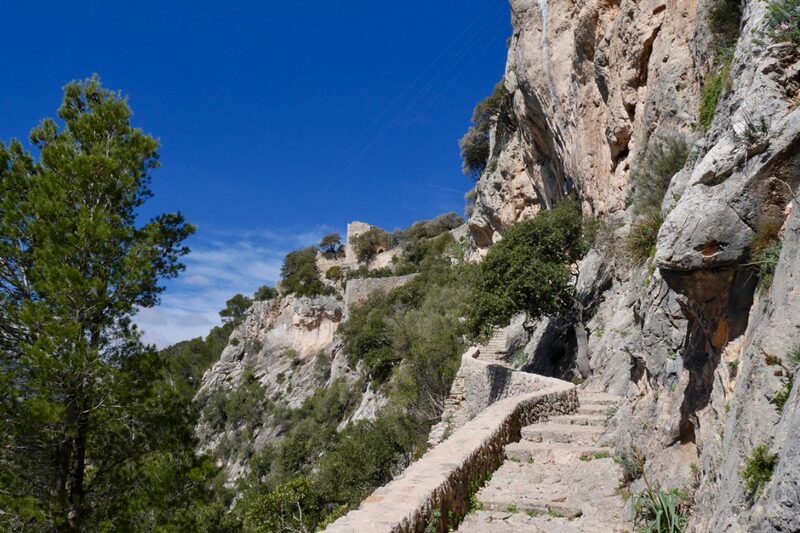 After a while we reach a small plain, the Pla d´es Pouet, where the surroundings unexpectedly open up to a cobbled path guiding you all the way up to Castell d’Alaró. Sadly, there is not much left of the ancient fortress, compared to the beautifully restored Castell de Bellver. But the ruins still have their own magic and you can easily tell why it was considered to be impregnable for a long time: It was set right on the ridge of the flat mountain top, with steep rock walls to all sides. 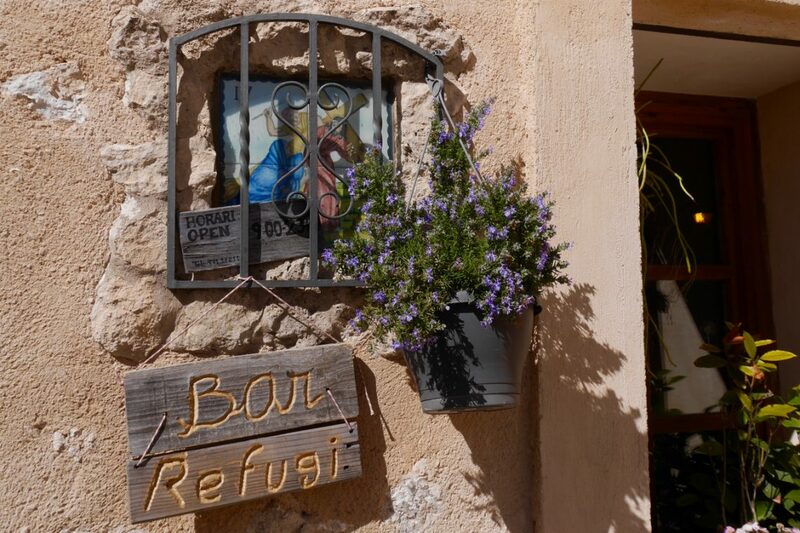 My secret love, however, is not the Castell but the small chapel and its guesthouse, Ermita de Nostra Senyora del Refugi, just a few steps further up. 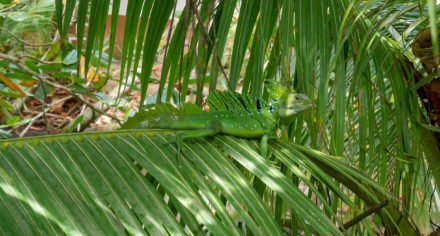 It features a large, south facing terrace with a unique panoramic view across the whole island. On a sunny weekday off-season, when only few people come to visit the Ermita, I could sit there all day in the quiet semi-shade of a tall tree. There is even a tiny bar that serves perfect coffee and homemade cakes. 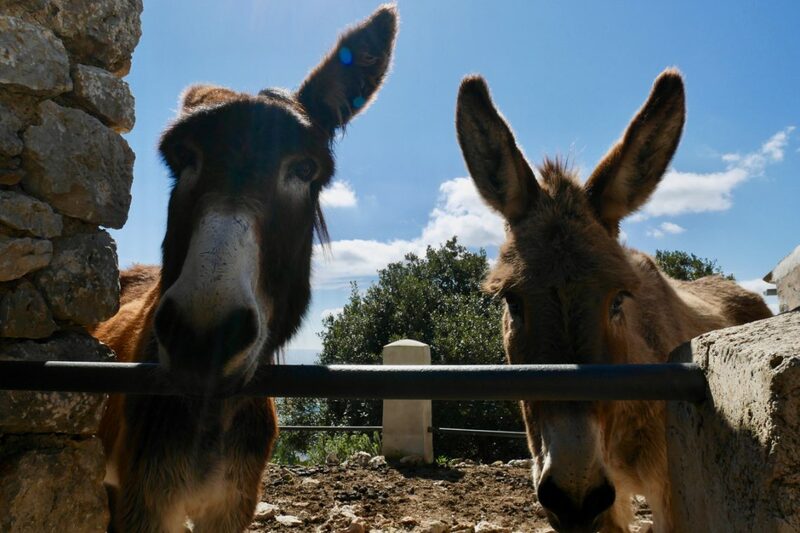 Thanks to the two shy donkeys who have their own gated terrace behind the guesthouse: they are the ones who carry everything up, there is no way to come here by car, truck or bike. On our descent we pass Es Verger, widely favored for its organic wine growing and authentic local cuisine, particularly for its lamb dishes. But it is almost impossible to get a seat without a reservation, and since we all had cake at the Ermita, anyway, we postpone our lunch at the restaurant to the next occasion. 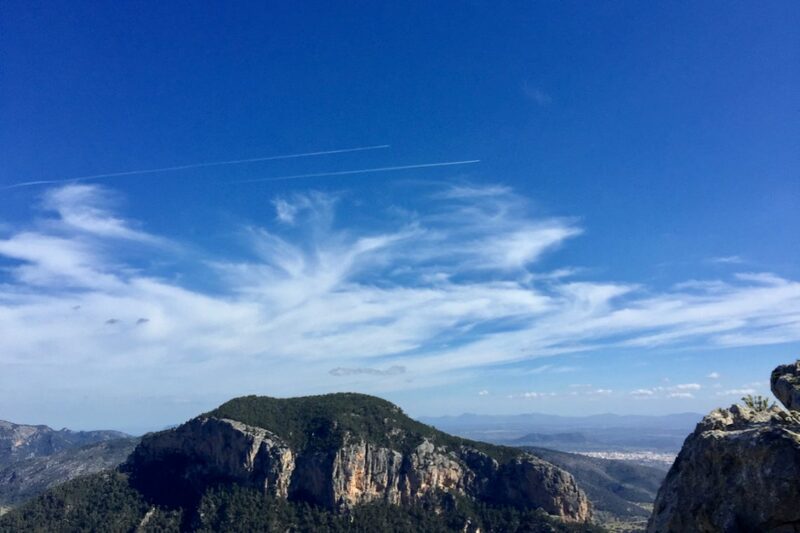 Back on the road, I marvel once again at the spectacular scenery formed by Puig D’Alaró and the opposite Puig de s’Alcadena. The two flat-top mounts form a a mighty gateway, the road in between leading from Orient to Alaró – with a race bike definitely one of the coolest downhills. Venga, venga!